The live action PG-rated family movie is a surprisingly rare occurrence in the current filmmaking climate. ‘Family friendly’ is too often taken to mean simply animated and, when we reach the live action realm, most comic book fantasy epics aim for an ‘inclusive’ 12A/PG-13 rating, while still dipping into violence and adult themes. Even movies that may have targeted that PG rating just a decade or so prior now often end up with the higher rating: eight years and a gritty reboot later and the Fantastic Four franchise is boosted up to a 12A, likewise the Tomorrowland’s and even the Star Wars’ of this world end up with a 12A more often than not. So, it gives me great joy to announce that Rob Letterman’s Goosebumpsis scary, exciting, action-packed and funny PG-rated family fun. Based on the immensely successful and embarrassingly prolific series of children’s horror yarns, Goosebumpssees Dylan Minnette’s Zach and his mum, played by the ever-reliable Amy Ryan, moving from New York city to Madison, Delaware for her new teaching job. Depressed by small town life, Zach strikes up a friendship with his next-door neighbour, Hannah (Odeya Rush): the only problem, Hannah’s overbearing, and rather odd, father (Jack Black). It turns out Hannah and her dad have been living under a false name and that he is actually the legendary Goosebumps writer, himself, R.L. Stine. All hell breaks loose when Zach and his newfound partner in crime, Champ (Ryan Lee), inadvertently release an army of Stine’s creations that had been bound to locked pages by his mystical typewriter. Then, in true Amblin fashion, Zach, Hannah and Champ have to rescue their town from the rampaging beasties. It’s a novel and intelligent use of Stine’s plentiful source and it provides our heroes with countless iconic foes to defeat. Each encounter is varied, fresh and inventive and, before any enemy has the chance to grow stale, we’re onto the next one. These monster set pieces are all really well-handled, but there’s one particular chase that, while not necessarily the most creative showdown, delivers real big screen thrills. The CGI from Sony Pictures Animation is consistently impressive and used sparingly, in keeping with the relatively modest $58m budget. Not only are the monsters well designed, but also the way they are brought to life and destroyed again is a lovely touch. In keeping with the internal logic that all these creatures were created on Stine’s pages, when the books are cast open, mercurial black ink oozes and swells into life and, when they are banished again, they disintegrate back into that black goo. It makes for some really visually exciting moments. Likewise, the FX department have a lot of fun with the horror imagery, and they pull admirably few punches. Barbarous teeth and fleshy mandibles snap and snarl at our heroes in pretty freaky fashion. I can see this being too much for certain young audience members, but those youngsters who enjoy a good jump scare are going to have a blast! But, forget the CG thrills, it’s the three leads that really sell the adventure. Minnette and Rush are both highly accomplished and act particularly well together. An early shared moment, while being both touchingly shot and rousingly scored, is rooted beautifully by the two young leads. Lee does a solid job with his comic relief role, although the fact that the sharp script ensures pretty much every character is given a hearty sense of humour lessens his importance somewhat. Black is also great, and gets close to hitting the kind of highs that made School of Rock and Kung Fu Panda so great. His rapport with the young leads is second to none and he gets a fair amount of dramatic weight to play with, taking him beyond the simple creepy father stereotype. I’d also like to mention how refreshing it is to see a studio crowd-pleaser avoid shamelessly playing for a sequel. ‘Franchise potential’ is all the rage at the moment and Goosebumps has got bags of it. But, first and foremost, Letterman and his writer Darren Lemke (working from a story by Scott Alexander & Larry Karaszewski) make sure to craft a standalone adventure that works a treat, whether ‘Goosebumps 2’ ends up happening or not*. Overall, Goosebumpsis a top-notch adaptation of a promising source. It delivers all the thrills you could want from a family trip to the cinema, alongside a strong emotional core and some really touching character moments. 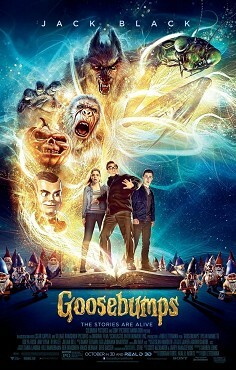 Goosebumpsdoesn’t play for a sequel, but, on the basis, of this initial effort, I’d be shocked, and disappointed, if we didn’t see Zach and co. again. * a sequel is currently in development.